Alright, from what I have read on this board and elsewhere, I have put together a summary of how the film was chopped down all the way to its international release. All comments and corrections are welcome. The original film upon completion ran around 186 minutes. The Socorro scene was cut, and the extended torture scene was trimmed due to a damaged negative, resulting in 179 minute running time. The film was dubbed into Italian, and shown at the premiere. Due to pacing reasons, Leone cut the Grotto scene out for a 176 minute version for Italian theaters. 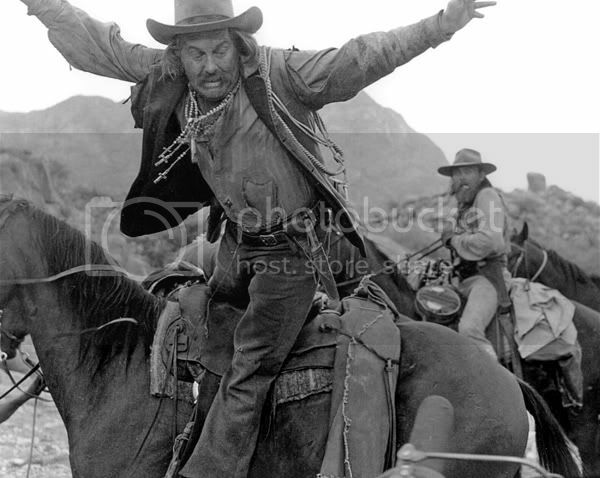 In 1967, 14 ADDITIONAL minutes were cut, resulting in the standard 162-minute version for the U.S. Eastwood, Wallach, and Van Cleef all dubbed their voices at this time. The 14 minutes of deleted scenes, (still in the Italian language), were used as extras on the 1998 DVD release. Finally, in 2003, the 14 minutes were restored and re-dubbed into English, as well as the 3-minute Grotto scene, resulting in the 179-minute Extended Version. I don't think that the extended torture scene was ever part of the film. And from where did you get that 186 min runtime? IMDB, but I just read on another thread that it may be a typo. The Italian version is often given in books with 180 or even 182 min. The difference may be explained by intermission music, exit music, by whatever or by whoknows. The scene was filmed, certainly, but was it ever actually included in any print of the film? According to MGM at least, the cave scene and extended torture sequence were part of the premiere version in Italy running 180 minutes. According to some sources, an intermission was added after the scene in which Blondie spills coffee over Tuco. And by the way, a little conspiracy theory on my behalf: I don't think they skipped adding the longer torture scene because of damage. I think the reason is, quite obviously, that as the music in the English shorter cut and Italian longer cut is completely different (different takes of the song) they couldn't properly edit the English dialogue into the scene without introducing ridiculous jumps in the music (try it yourselves!). So they just pulled a worn out print version of the sequence and slapped on the "too damaged to incorporate" excuse because they thought people would accept that excuse better. I think you might be on to something (as opposed to "being on something" ). One other reason may be that the scene works better in the shorter version. Off topic: in the scene above with Cary Grant and Hitchcock, that's typically an example ahown when explaining letterbox format. Without seeing everything, one doesnt know Alfie is even there. Yeah, this is actually a pretty interesting example because I've had two VHS versions of To Catch a Thief, one of which was missing old Hitch from the side of the frame (pretty ridiculous really, since he's known for having a cameo in almost every film he's done) but the other one panned to the right of the frame after Cary Grant turned his head away from the bird cage (a particularly ugly pan, obviously not a camera move). Right. I have VHS boxes from the 80s & 90s, the original Italian (theatrical) running time was 175 min. Leone himself shortened the film (with his editors) down to 161/162 minutes for the international market. The general opinion was, that outside of Italy audiences would have problems with the opera-like close to 3 hrs running time. Longer running times of 180 + could also be the result of early promotion / news coverage. I suppose his preview version (either with more footage or / and additional music cues) was about that length and as we know medias talk about a film as soon as it is finished - before it is released.